Aboriginal and Torres Strait Islander peoples have a unique place in Australia as the original inhabitants of the land. Across the country, many individuals and communities maintain strong connections to their culture, language and traditional lands, while also contributing to the environmental management, economic development and cultural identity of our nation. Aboriginal and Torres Strait Islander peoples hold distinctive rights as Australia’s First Peoples, set out in international law. And in 2009, Australia gave its formal support to the United Nations Declaration on the Rights of Indigenous Peoples, a ground-breaking document that seeks to reset relationships between indigenous peoples and governments around the globe. However, despite some improvements in recent years, Aboriginal and Torres Strait Islander people continue to be one of the most vulnerable groups in Australia. In 2011, almost 670 000 Aboriginal and Torres Strait Islander people were living in Australia; around 3 per cent of the Australian population. By 2031, it is estimated that this number will exceed one million, with Aboriginal and Torres Strait Islander people comprising 3.9 per cent of the population. One third (34.8 per cent) of Aboriginal and Torres Strait Islander people live in major cities; 43.8 per cent live in regional areas; 7.7 per cent live in remote areas; and 13.7 per cent live in very remote areas. In 2011, more than one in three Aboriginal and Torres Strait Islander people were under 15 years (36 per cent), compared with one-fifth of non-Indigenous Australians. Almost 4 per cent of Aboriginal and Torres Strait Islander people were aged 65 years and over, compared with 14 per cent of non-Indigenous Australians. In 2011, 11 per cent of Aboriginal and Torres Strait Islander people spoke an Indigenous language at home. In 2010-12, the average life expectancy of Aboriginal and Torres Strait Islander people was approximately ten years (10.6 years for men and 9.5 years for women) less than that of non-Indigenous Australians. Leading causes of death included heart disease, diabetes, respiratory disease and cancer. Just over half (52.2 per cent) of Aboriginal and Torres Strait Islander people aged between 15 and 64 years were not employed in 2012-2013, compared with 24.4 per cent of non-Indigenous Australians. One in five Aboriginal and Torres Strait Islander women experienced physical violence in the previous 12 months, compared to 7 per cent of non-Indigenous women. Over the same period, Aboriginal and Torres Strait Islander women (12 per cent) were three times more likely to experience sexual violence than non-Indigenous women (4 per cent). 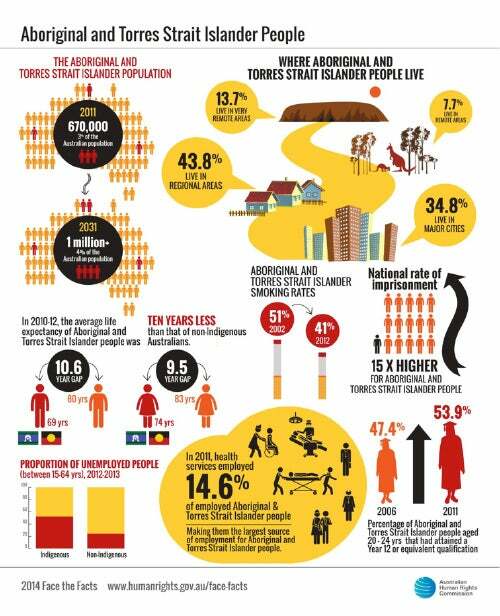 In 2008, half of all Aboriginal and Torres Strait Islander people aged 15 years and over had some form of disability. In non-remote areas, Aboriginal and Torres Strait Islander people were one-and-a-half times more likely than non-Indigenous adults to have a disability or a long-term health condition. Around one in twelve Aboriginal and Torres Strait Islander adults are part of the Stolen Generations. In 2008, 8 per cent (26,900) of Aboriginal and Torres Strait Islander people aged 15 years and over stated that they had been removed from their natural family. 35 per cent assessed their health as fair or poor and 39 per cent experienced high or very high levels of psychological distress. The national imprisonment rate for Aboriginal and Torres Strait Islander adults is 15 times higher than that for non-Indigenous adults. In the December quarter of 2013, Aboriginal and Torres Strait Islander people comprised 28 per cent of Australia’s full-time adult prison population. There were approximately 250 Australian Indigenous languages spoken at the time of colonisation. However, a 2005 survey found that only 145 Indigenous languages are still spoken to some degree and less than 20 are considered to be “strong” and able to be spoken by all generations. Between 2005-07 and 2010-12, life expectancy for Aboriginal and Torres Strait Islander men increased by 1.6 years and by 0.6 years for women. Over the same period, the life expectancy gap between Aboriginal and Torres Strait Islander people and the rest of the Australian population reduced by 0.8 years for men and 0.1 years for women. In 2011, 53.9 per cent of Aboriginal and Torres Strait Islander people aged between 20 and 24 years had attained a Year 12 or equivalent qualification, up from 47.4 per cent in 2006. Higher levels of educational attainment are associated with better health outcomes. Between 2002 and 2012, Aboriginal and Torres Strait Islander smoking rates dropped from 51 per cent to 41 per cent. The 2011 Census results show that health services currently employ 14.6 per cent of employed Aboriginal and Torres Strait Islander people. Health services are the single biggest “industry” source of employment for Aboriginal and Torres Strait Islander people, expanding by almost 4,000 places since 2006. The Aboriginal rock art in Western Australia’s Dampier Archipelago is at least twice as old as the Pyramids of Egypt. The Aboriginal and Torres Strait Islander Social Justice Commissioner keeps the human rights issues facing Australia’s First Peoples before the Australian Parliament by preparing an annual Social Justice Report and Native Title Report. He also promotes community understanding of and respect for the rights of Aboriginal and Torres Strait Islander Peoples. The Commission’s role includes reviewing the impact of laws, policies and programs on Aboriginal and Torres Strait Islander people, as well as providing policy advice and research on a range of pressing human rights issues. The Commission also hosts the Close the Gap: Campaign for Indigenous Health Equality. Australian Bureau of Statistics, 3238.0.55.001-Estimates of Aboriginal and Torres Strait Islander Australians, June 2011 (August 2013). Australian National University, CAEPR Indigenous Population Project, 2011 Census Papers - Paper 14, Population Projections (2011), p 4. Australian Bureau of Statistics, note 1. Australian Bureau of Statistics, 2075.0-Census of Population and Housing: Counts of Aboriginal and Torres Strait Islander Australians, 2011 (June 2012). Australian Bureau of Statistics, 2076.0-Census of Population and Housing: Characteristics of Aboriginal and Torres Strait Islander Australians, 2011 (November 2012). Australian Bureau of Statistics, 3302.0.55.003-Life Tables for Aboriginal and Torres Strait Islander Australians (November 2013), p 8. Australian Bureau of Statistics, 3303.0-Causes of Death, Australia, 2011 (March 2013). Department of Prime Minister and Cabinet, Australian Government, Closing the Gap, Prime Minister’s Report 2014 (2014), p 12. Victorian Health Promotion Foundation (VicHealth), Preventing violence against women in Australia: Research summary, (2011) p 5. Australian Bureau of Statistics, 4704.0-The Health and Welfare of Australia's Aboriginal and Torres Strait Islander Peoples (Disability and Social Inclusion), October 2010 (February 2011). Australian Bureau of Statistics, 4704.0-The Health and Welfare of Australia's Aboriginal and Torres Strait Islander Peoples (Social and emotional wellbeing), October 2010 (February 2011). Australian Bureau of Statistics, 4512.0-Corrective Services, Australia, December quarter 2013 (March 2014). Australian Bureau of Statistics, 1301.0-Year Book Australia, 2009–10 (June 2010). Australian Bureau of Statistics, note 7, p 51. Department of Prime Minister and Cabinet, Australian Government, note 9, p 11. Australian Bureau of Statistics, note 11. Australian Bureau of Statistics, 4727.0.55.001-Australian Aboriginal and Torres Strait Islander Health Survey: First Results, Australia, 2012-13 (November 2013). Australian Bureau of Statistics, ‘New 2011 Census data reveals more about Aboriginal and Torres Strait Islander peoples’(Media release) 30 October 2012. Australian Heritage Council, National Heritage Assessment: The Dampier Archipelago (including the Burrup Peninsula) (2006).